Evening Études: Linda and Dwight Ost of 28th Street traveled down to Half Moon Bay in early February to join other music lovers in a wistful farewell to a grand piano. The “Sunset Piano” was the idea of musician and artist Mauro Ffortissimo, who had inherited the old instrument but knew it was beyond repair. 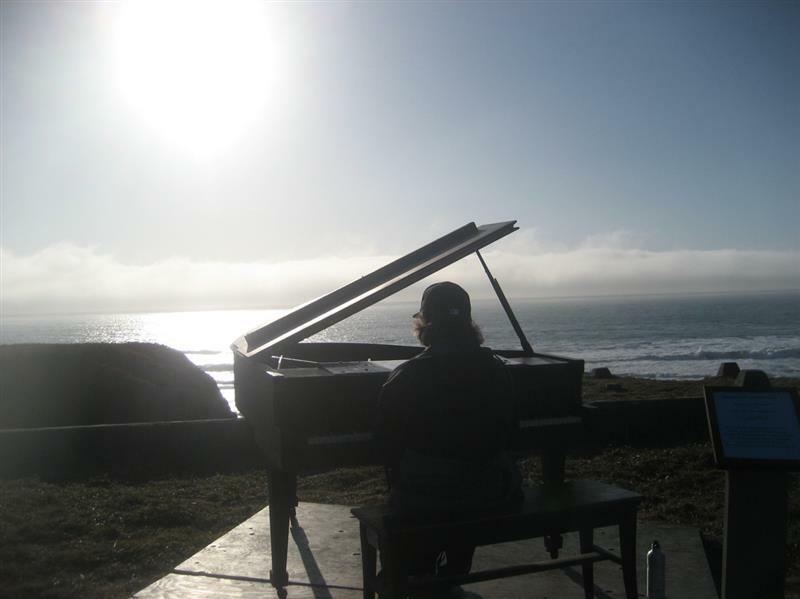 He and friends hauled the piano to a cliff above the ocean, and at dusk for two weeks played their musical tributes, finally bidding goodbye on Valentine’s night. Linda Ost took this photo of husband Dwight at the keyboard, and sent the Voice her moving account of their evening with The Piano at Half Moon Bay. Solve the Crossword Puzzles from past issues! The entire contents of the Noe Valley Voice print and Web editions are protected by copyright. It is inconsiderate and illegal for you to use our stories or photos in your own publication or blog without first contacting us, getting our permission, and giving us credit. It's often very easy to use our stuff if you give us and the writers and photographers the respect we deserve. Please contact us with any questions you may have. Thank you!